Stiletto, the first of the series. Comes with two appropriate servos and 3 wire on/off switch installed. The Stealth S1 was developed after the Stiletto Series and the Stealth S2. The S1 and S2 Model also comes in three versions. Prices shown are for basic kits. Version1 no electronics. Version 2: Includes 2 appropriate servos and servo extension installed. Version 3: Includes all electronics, including 2.4GHz 2CH :Pistol grip Transmitter, Receiver, on/off Switch and 4cell Battery holder. As with any of my kits, they are complete to the smallest detail. You don't have to run to the Hobby store for anything. Stiletto! A 1/4 scale R/C model of my America's Cup winning US 203. It has many of the same features found on full size land yachts. I Including a double-tapered wing mast and weight-tuned suspension. Stiletto is not a "sailboat on wheels", rather, it is a true land yacht model. With a top speed of over 30 MPH, you won't find a better kit anywhere. If you are looking for a model land yacht, here it is. Click on the categories on the left and choose. Merrill Brady from MM Glidertech does a professional job producing my Fiberglas parts. He is well known among model glider enthusiasts. Meanwhile, the Bat has been extensively tested and praised by customers. Sadly the Bat 1, produced by Hobby King is being phased out. H.K. also declined merging into the Bat 2 line. Knowing this I purchased a major amount of hulls to be able to continue to offer both Bat 1 and Bat 2 models. Not having had any control of the materials used by Hobby King Bat 1, MLY Bat Models include updates and upgrades. As with the Bat 2 the MLY Bat 1 can be ordered in the color of your choice at no extra cost. In winds over 18 mph a smaller sail works on both Bat 1 and Bat 2 Models. 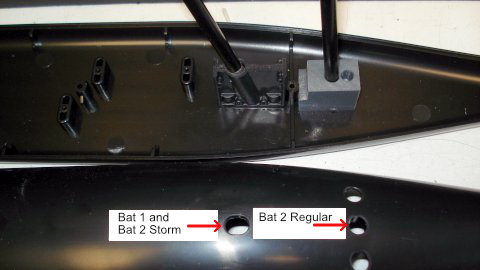 On the bat 2, the storm sail steps into the Bat 1 (rear) mast step opening. Bat 2 Instructions are now available. Sailing Model Land Yachts is a sport with a solid base of dedicated enthusiasts and racers who appreciate landsailing because it is easy to learn and challenging to master. It is an inexpensive sport; whether you're just beginning or a seasoned racer. Races involve groups ranging from local clubs to international competitors. And, it's environmentally friendly! In fact, the U.S. Bureau of Land Management has rewarded racers and enthusiasts with special access to dry lakes for competitions. It's an increasingly popular sport that is enjoyed by a diverse range of people. The models I have developed are the result of years of racing experience and technical knowledge of the particular mechanics of landsailers. While there are some similarities (both sailboat and landsailer have a sail, for example), there are some fairly distinct differences between them: most notably.......speed! Think of half a high-performance glider (airplane)....on edge and on wheels, and you're beginning to get the idea. Stiletto is designed by three-time America's Landsailing Cup winner, long-time R/C modeler, and all-around interesting person Robert Weber. He has been landsailing since 1986 and has traveled the world for the sport: participating in international competitions in Europe and Australia. If you have completed your orders, click here to go to the Checkout Page. 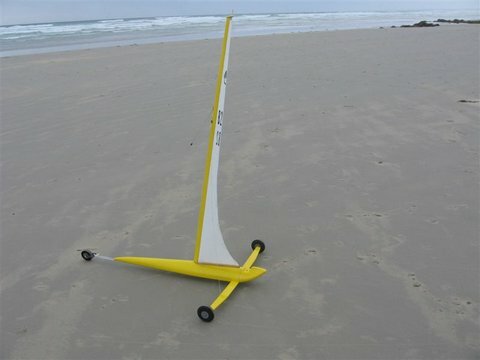 For more Model Land and Ice Sailing, go to http://www.ircssa.org/. For Full Size Land and Ice Sailing, go to www.NALSA.org. The Bat 1 designed by me, produced and sold by Hobby King introduced the world to RC Model Land Sailing. It has been successfully sold worldwide.Several attempts to merge into the Bat 2 line were declined by Hobby King. which I now can sell for a reduced price. Due to its larger Class 2 size, a perfectly tuned suspension and a flexible mast, the Bat 2 acts like its glued to the ground as it accelerates to unbelievable speeds, while allowing great control by the pilot.